Squats are a great way to strengthen the muscles in your thighs, calves, hips and buttocks. They’re also a great way to strengthen your bones and ligaments, and the supplement of tendons all over the lower half of your body. Most trainers will advise against performing squats if you have problems with your knees or lumbar pain, as they are a weight training exercise. Before doing squats, it’s important that you know the correct position and methods otherwise you might suffer excessive muscle pain. Experts recommend that one set of 10-15 squats is generally enough. If you can manage more, do up to three sets a day. Ideally, do squats 2-3 times a week when you do resistance training. It’s usually best that these days are not consecutive, and you give yourself a day to recover in between. If you’re only just beginning to exercise, make sure you don’t add any weights to your squats training before gradually adding weights over time. How Should I Do Squats? Open your feet wide apart (slightly wider than your shoulder width), with your hips stacked over your knees and knees over your ankles. Reach your arms out in front of you, so that they’re parallel with the floor. Your palms should be facing down. Start by taking a deep breath, and moving your hips backwards as you bend your knees ever so slightly. As your buttocks points out, ensure that the rest of your upper body, back, shoulders and chest, remain straight. Keep your face and eyes looking straight ahead. Now you’re ready to go down further, until your hip joint reaches below where your knees usually are. Release your breath as you put pressure on your legs and push up to resume staring position for the next squat. If you’re only just starting out, don’t add any weights until you have achieved the perfect stance and can do them properly without straining any of your muscles. Hold a dumbbell, kettlebell or medicine ball to the middle of your chest as you do the regular bodyweight squat we outlined above. To really work all your muscles, drop your elbows between your knees. This type of weight squat is great for beginners as it helps them achieve better body posture and prevents them from awkwardly leaning forward (a common mistake beginners make when squatting). Using a barbell in your squat training can be a lot harder than you think so it’s usually best to ask a trainer to guide you the first few times so you don’t accidentally do any long-lasting damage to your muscles. As the name indicates, the weights are going to be on your back (either upper or lower back), where it’s easier to squat carrying a heavier load. Make sure your hands are in front of you, on the same line as your shoulders, with your elbows facing the ground. Also make sure that the barbell is placed over the center of the feet, to prevent your hips from going back too much. Front squats should only be performed by more experienced squatters, as the barbell will be placed across your collar bones. It’s a difficult position that requires more flexibility, which is why it’s imperative that you are more comfortable doing the other squats first. 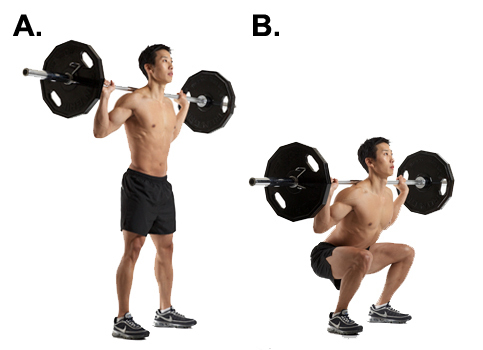 In a front squat, your elbows should point straight out, with the upper half of your arm parallel with the floor. With your fingertips, reach back and hold the bar, outside your shoulder area. Even though you may think it’s not the most stable position, with your arms positioned in the way they are, you have a solid base so all your hands do is prevent the bar from rolling away. The bar will be secure as long as you make sure your elbows stay erect, extending right out from your shoulders. Warm Up. Before you start any type of exercise, it’s important to warm your muscles up to prevent straining or overstretching them. Stretching helps prepare your muscles for the activity it is about to undertake and also help prevent injury, especially during weight squats. One of the best warm up activities for squats is the glute bridge, which opens up your hips and enables you to move into a lower squat. Depth. To achieve more depth in your squat, take a wider stance when starting. By going lower in your squats, you are engaging more muscles. The lower you manage to go, the more effective your squats will be, just make sure you maintain the right form (keeping your upper body straight—back, shoulders and neck). Knees. Another great trick is to keep your toes pointing outwards (anywhere from 5-20 degrees), which helps prevent your knees from going in. Your knees should always be in line with your ankles and hips, go prevent injury and also to be able to get into a better position. Body. Try to put most of your body weight in your heels when squatting, rather than the tip of your toes which can’t stand as much weight or pressure. This will also help keep your body erect during the squat. Descending. After adding weights to your squats, it’s important to pay attention to the speed you go down into position. Moving too fast can cause injury. While standing up quickly is fine as long as you maintain a straight body posture, getting low into the squat should be done more slowly so that you pay attention to your posture and ensure you’re not angled awkwardly or straining your muscles.